Zimpapers has been commended for their support and raising cancer awareness ahead of the second edition of the Cancer Power Walk which is set to take place on Saturday. 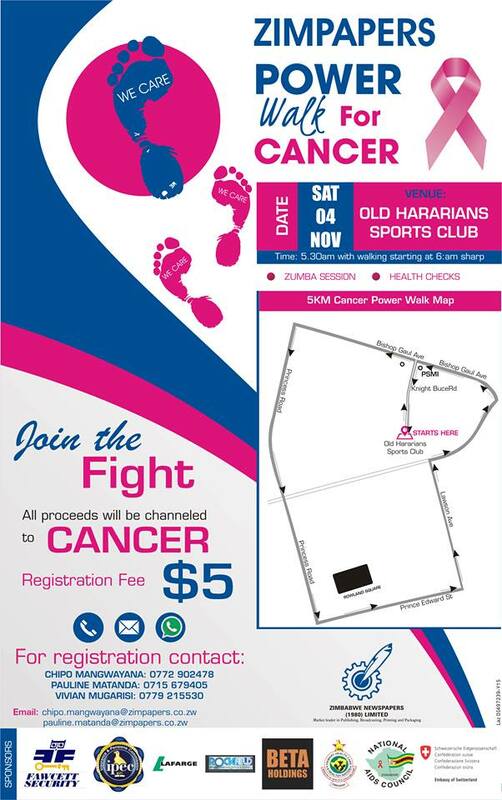 The walk will be starting at the Old Hararians Sports Club in Milton Park with registration starting at 5:30 am for 6.00am. The event which is in partnership with Island Hospice and Healthcare is an effort to ease financial constraints faced by cancer patients. Zimpapers Public Relations and Corporate Affairs Manager Beatrice Tonhodzayi said that lack of funds has been notably critical when it came to cancer and lifestyle issues. “Cancer is a huge strain not just emotionally but financially. “We have noted that lack of funding is a critical issue when it comes to the issue of Cancer and other lifestyle conditions. “Some opt to go out of the country and again, huge costs come with this and they ask for help. So; we would like to raise some funds for Island Hospice’s programmes through this,” Tonhodzayi said. Well-wishers have been urged to pre-register for their tickets through the group’s EcoCash merchant code 33636. Tickets for adults and children are going for $5 and $2 respectively and are physically available for purchase at Herald House. Early dictation saves lives and the power walk has enabled people to have all required information at their disposal while keeping fit. Island Hospice and Healthcare Executive Director Bev Sebastian credited the number of people seeking service to Zimpapers’ advocacy and communication through articles and radio programmes. “There is also growing appreciation of the need to manage pain in people with life-threatening illnesses. “Even if one has reached a critical stage; they still can get pain relied while their loves ones and them can undergo counselling as a way of helping them cope,” Sebastian was quoted as saying. Several other sponsors including the Ministry of Health and Child Care, National AIDS Council, Fawcett Security, IPEC, Lafarge, Rockfield Engineering, Beta Holdings, Embassy of Switzerland, Musikana Dzidza, CIMAS, Tingamira and Medirite Healthcare have chipped in to sustain the cause and bring the vision to life.